One of the best methods for finding motivation to lose weight is to look at pictures of yourself. This is precisely what Macker3 did. 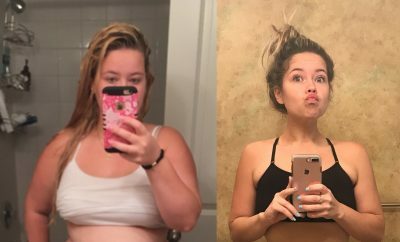 Seeing herself at such a heavy weight wasn’t a laughing matter anymore and prompted her to start her weight loss journey. 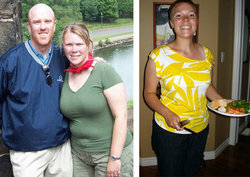 She has lost an incredible 67 lbs by making changes to her eating and exercise habits. I was 220 pounds and none of my clothes fit! I was constantly tired and frustrated and I just did not feel well. It wasn’t until my husband took a picture of me at Disneyland that I was in utter shock. I could not believe that was me! I told myself that it was time to lose the weight. I have tried fasts and juice cleanses to lose weight. That just made me sick and the weight just came back on. I started to run and do hot yoga, then the diet followed. I had to learn how to eat what was best for body. I started to eat more vegetables and natural foods. I learned how to read labels and what worked for my body to stay healthy. I also learned how to portion control my food when I cooked and when I went out to restaurants. After losing all the weight I tried Pure Barre, recommended from a friend, to tone and tighten my body back up. Calorie count was the best way for me to control my portions and stay motivated. I could not believe how many calories I was eating when I first started. Once I started to understand calories and portion control I started to lose the weight. It was also motivating to read the success stories. It helped me to keep moving forward when I hit my plateau. It was really difficult when I first started losing weight. I was so used to running to fast food places for dinner and now I had to learn how to cook and make sure the calorie count and food was healthy for me. There were times that I hit plateaus and that was frustrating, but I kept pushing myself to move forward and stay motivated. Doing this helped me learn how to push myself with exercise; I have learned the true meaning of mind over body. I Started seeing results 2 months after the start of losing weight. I had a long way to go and seeing the results just kept me going. I indulge. I never deprive myself. I eat what I want but I just eat less of it. If I want cheesecake, I best know I am going to have it, I just won’t eat the whole slice. I have learned the true meaning of satisfaction which has rolled into my life. When I do have a bad day, I just tell myself, that was fun! Now it’s time to get back on track. I try to never make myself feel bad. We all have our moments and we should never make ourselves feel bad for giving in. My life has changed immensely. I have learned to love health and nutrition that I changed my career to that industry. I now instruct pure barre (pilates and ballet based workout) and motivate people every day. I love it! I was once in their shoes and I know what it feels like to go through the process. I love being healthy and I love sharing that passion with so many other people who are struggling. I have maintained my current weight for a year and a half. Learn what diet works best for you. Count your calories and learn how real food can be so much more satisfying. Change up your workout, it feels good to challenge yourself in a new way. Mind over body always! You can do anything you set your mind to if the passion and drive is there. 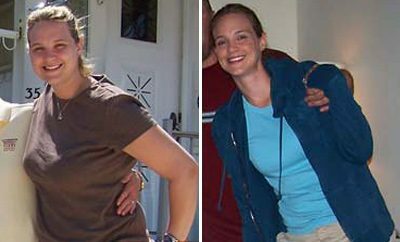 Next Story → Jessie, goes from 160 Lbs. to 120 Lbs. 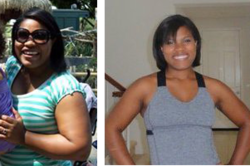 Read on for more about this amazing transformation!